WeedBiz is an Authorized Distributor of CannaPods, a revolutionary new way to quickly deploy low-cost, high-yield hydroponic grow space for your cannabis production operation of any size. CannaPods are more than just cannabis grow rooms. CannaPods offer both small-scale and commercial cannabis growers alike the ability to quickly deploy energy efficient, sustainable hydroponic cannabis production units that will lower costs and increase yields in just a few months. 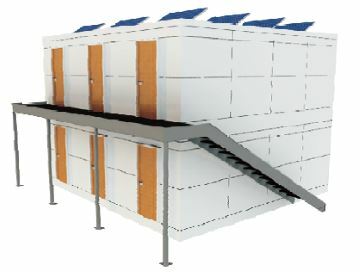 CannaPods are controlled growing environments made of structurally insulated building panels that utilize vertical hydroponic growing systems. 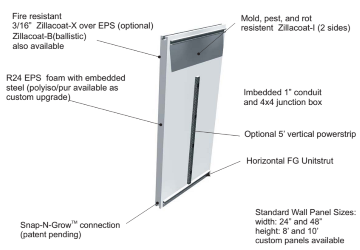 By using cutting edge insulation technology in the construction process, CannaPods allow growers to control air temperature, water temperature, humidity levels, CO2 levels, and ventilation methods with pinpoint accuracy. Better than shipping containers – CannaPods are more customizable, versatile and energy efficient (by far) than old rusty used shipping containers, and much easier to construct than a traditional custom building or indoor retrofit. Also, unlike a container CannaPods are suitable for use as a laboratory environment. Customize your rooms – The size of the room is your choice. A grower can choose a 50′ by 50′ room for commercial production, or design an 8′ by 10′ room for personal back yard purposes (and anything in between). Indoor, outdoor and greenhouse solutions – CannaPods will not be affected by the ambient air temperatures and can be placed anywhere. Boost production! – By creating a reliable and consistent grow room environment 365 days a year, CannaPods give growers the ability to track grow room data and maximize yields. Stack them up – If you don’t have a large footprint to work with, CannaPods can be stacked on top of each other allowing efficient use of land and warehouses. Quick construction – Our units are delivered to your site, ready to construct. The construction process is quick, easy, and requires limited resources. Also, they are easy to take down if you want to move your investment. Long term solution – CannaPods will not need replacing like greenhouses or grow tents. Lab environment – CannaPods are made of composite materials that are impervious to mold, mildew, rot, and insects. Because of the flexibility in the manufacturing process, CannaPods can be the perfect solution for many different types of cannabis operations. 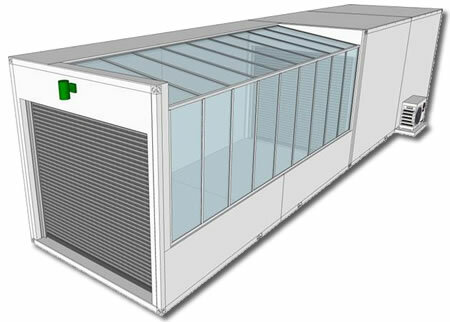 CannaPods offers both heavy duty stand-alone buildings for outdoor use as well as a light weight option for indoor grows. Looking to retrofit a warehouse or other commercial area for a large cannabis grow operation? CannaPods provides large-scale producers an excellent, money-saving option to standard construction. Each CannaPod includes dozens and dozens of options and available upgrades to suit any grow situation. All units ship with the following standard features. Turn-key units are also available. Other Pod manufacturers say “turnkey” but don’t include grow system or controls. CannaPods are truly turnkey – complete with state of art control system and Plug and Play Ebb and Flow racking systems. MCIG CannaPod interiors are carefully designed and approved by the industry’s leading growing consultants and feature components by top brand names in the business; Cooling by Samsung, Link 4 Environment Control, Black Dog Led lights, Titan Co2 Enrichment Kits, IC Real Time Security System by Security Grade, and much more. After submitting an inquiry you will be contacted by a CannaPods sales representative to complete a site questionnaire, which asks important questions about your operation so that we can provide you with a complete and accurate quote for a product that will meet all of your needs. Once we discuss your quote with you and verify financial information then delivery and setup details will be confirmed with you. If your order requires custom design or fabrication then it will be added to our manufacturing queue and we will provide you with an estimated date of completion. Delivery from the date of order is typically 2-4 weeks. CannaPods are delivered to your site ready to construct. The setup process is relatively fast and requires far fewer resources than traditional construction and can either be completed by the customer by following the included instructions or by a contractor, which we are happy to provide if needed. Indoor CannaPods are light-weight and easy to install. Our outdoor solution will require a proper foundation and the use of either a small crane or a forklift. CannaPods has worked with a leading greenhouse manufacture to develop a hybrid version of our outdoor unit for customers who are interested in both indoor and greenhouse cannabis production. CannaPods unique indoor/outdoor solution is guaranteed to hit that sweet spot for cannabis growers who want the best of both worlds.